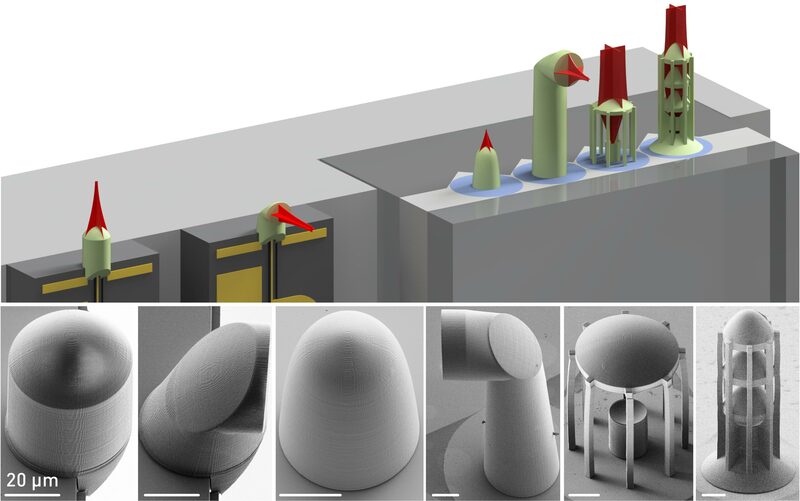 We have shown that these challenges can be overcome by in situ printing of facet-attached beam-shaping elements. Our approach allows precise adaptation of vastly dissimilar mode profiles and permits alignment tolerances compatible with cost-efficient passive assembly techniques. We demonstrated a selection of beam-shaping elements at chip and fiber facets, achieving coupling efficiencies of up to 88% between edge-emitting lasers and single-mode fibers. We also realized printed free-form mirrors that simultaneously adapt beam shape and propagation direction, and we explored multi-lens systems for beam expansion. The concept paves the way to automated assembly of photonic multi-chip systems with unprecedented performance and versatility.